From Clothing and Accessories to Golf Equipment, we have everything you need – and want – for the game. Our golf team will help deliver the most memorable experience during your day at Olympic View Golf Club and will help outfit you with anything you need. We carry a wide selection of brand-name men's and women's golf equipment, leisure and sportswear, as well as accessories, footwear, souvenirs and rental equipment. We Will Meet or Beat our Competitor's Advertised Price! 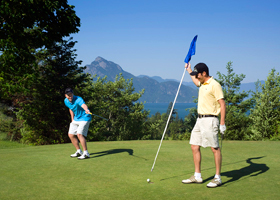 Olympic View Golf Club is owned/operated by the GolfBC Group, and is part of the GolfBC Rewards Program. With every purchase you can earn valuable GolfBC points, redeemable for FREE rounds of golf. Hours: Golf Shop is 7 days/week from dawn to dusk.